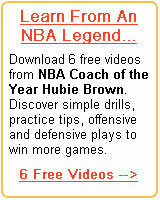 Sign up to get free tips, plays & coaching resources! 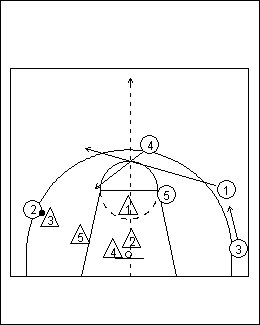 In this defense, three defenders, players #1, #2, and #3, play man-to-man against three outstanding opponents, while the two best rebounders, #4 and #5, use zone principles. 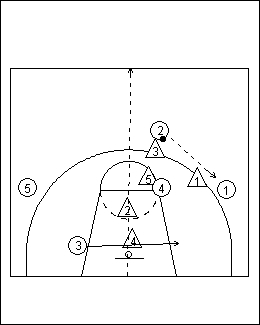 This defense is effective in eliminating lane penetration. It is explained in the following. To view full sized diagrams, click on any thumbnail. Use your browser's Back Button to return to this page. When their assigned player is on the strong side of the floor, they play him with whatever man-to-man principles the coach chooses. In other words, they could use standard man-to-man rules, or some other, like help-and-recover. 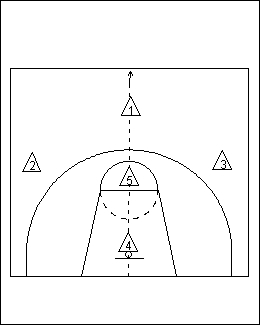 Whenever, their defensive assignment is on the weak-side of the floor, he must take a position on the imaginary line between the ball and their assigned player. 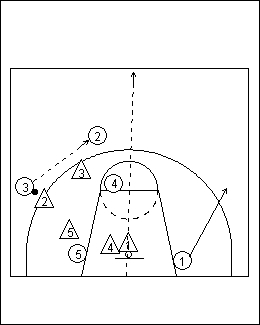 As mentioned before, players #4 & #5 play a zone which keeps them closer to the basket. Their rules are depends on the choice of the coach. 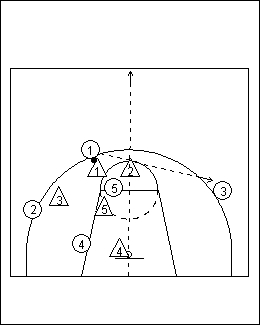 For instance, if you would like to trap the ball in the corners, player #5 should cover the ball in the left corner and player #4 would cover the ball in the right corner. These rules are interchangeable to fit the talent of the individual players. 1. Keep their hands up and/or outstretched at all times. 2. All move with the offensive player movement or ball movement, whether by pass or dribble. 1. #5 covers the left corner. 3. Players #5 & #4 always align themselves between the ball and the basket, defending against anyone in this vicinity, and always looking to deflect or intercept a pass. Defensive players change their position with movement of players, or the ball, whether it be by dribbled or passed. Here Offensive player #1 has dribbled the ball into the left-hand side of the court and the defensive players #1, #2, #3, #4, & #5 have shifted their position in accordance with the established rules for the 3-2 Strong-side Combination Defense. 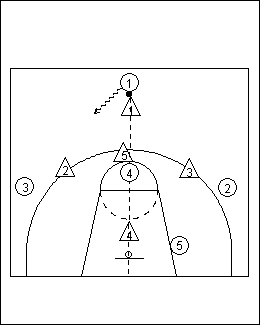 This sequence shows offensive player #1 passing the ball and making a deep cut to the basket thus initiating a possible give-and-go with his teammate #3. Offensive player #3 has taken the pass from #1 but defensive player #1 has prevented a successful give-and-go. Notice that Offensive player #1 now has taken a position at the low-post on the weak-side; thus, defensive player #1 has taken the proper position on the imaginary line between the ball and his defensive assignment on offensive player #1. Also, notice that defensive players #5 & #4 have followed their rule and have aligned themselves between the ball and the basket and defensive player #3, assigned to guard offensive player #2, has taken his position on the imaginary line between the ball and offensive player #2. He will change this position with the movement of his assigned opponent. Defensive player #2 is in the bubble of his defensive man-to-man assignment and his teammate, #3 has taken the standard man-to-man defensive position against his assignment, offensive player #2 who has moved to the strong-side of the court. 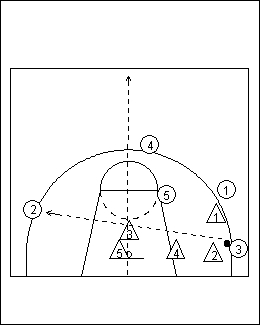 Notice that defensive player #1, following the rules for this defense has taken his position on the imaginary line between his defensive assignment, offensive player #1, who presently is at the weak-side low-post position; however, he will adjust his position according to the rules as his opponent moves to the weak-side wing. Defensive player #2 is up on his man-to-man assignment, offensive player #2 with the ball. He will pressure his dribble all the way into the opposite side of the court. 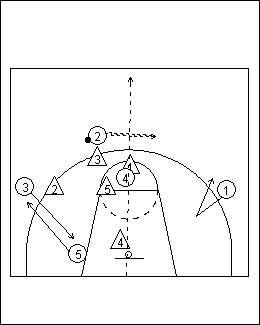 Notice that defensive players #5 & #4, in accordance with the rules have aligned themselves between the basket and the ball. With offensive player #1 on the weak-side, defensive player #1 is properly positioned on the imaginary line between his man-to-man assignment and the ball. He will adjust this position with both the movement of the ball and offensive player #1, the man he is assigned to guard. 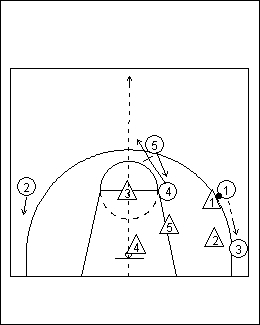 In this sequence, defensive player #2 is guarding his assignment, offensive player #3, in a standard man-to-man defensive posture; however, the movement of his assignment and the ball dictates his changing position as dictated by the rules for this defense. Offensive player #2 has picked up his dribble in the opposite side of the court thereby making it the strong-side. All players adjusted their positions in accordance with player and ball movement as specified in the rules. Notice that offensive player #5 is seemingly unguarded. This is because the coach has decided he is one of the two weaker outside shooters on the opposing team. Had he been an outside threat, the coach would have selected him to be one of the 3 players to defend man-to-man, or possibly planned to handle this particular situation in some other manner. Keep in mind everything in this defense is dictated by the rules. 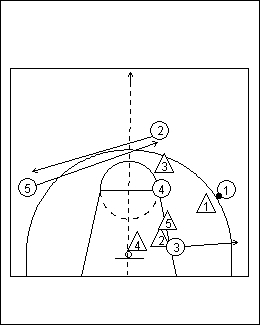 In this sequence, offensive player #2 has passed the ball to offensive player #1 and screened away. His defender, #3 adjusts his position according to the movement of #2 and offensive player #1 with the ball. Notice here, defensive zone players #5 & #4 have aligned themselves between the ball and the basket. They are playing ball defense and at the same time looking to intercept any pass made to an opponent in their general vicinity. Defensive player #1 is up in the face of his assigned opponent #1. He need not worry that #2 would beat him on a dribble as his teammate, #5 would pick him up. Utmost pressure should always be kept on the player with the ball. Try to make him throw a lob pass that can be intercepted by a teammate. Notice that offensive player #2, seemingly, is unguarded. Well, he isn't! His defensive guard, #3 has positioned himself, according to the rules, on the imaginary line between his assignment and the ball. Defensive player #3 is inviting a skip pass from the opponent with the ball. If his teammate is pressuring the ball as he should be, then defensive player #3 could intercept a lob skip pass to offensive player #2. Offensive player #1 has passed the ball to his teammate, #3 who has moved out to the corner. All defensive players have shifted as the pass was made and are in the position dictated by the rules. 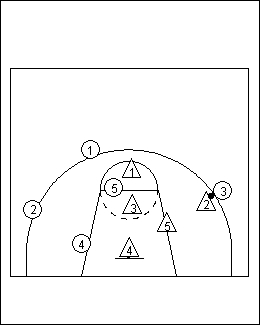 In this sequence, offensive player #3 makes a skip pass to his teammate, #2, on the weakside of the floor. All defensive players move on unison with the flight of the ball to their individual positions as dictated by the rules for this defense. The strong-side of the floor has now shifted to the opposite side of the court and the defense continues as dictated by the rules. Defensive players #1's and #2's positions will progressively change with the movements shown by their assigned opponents, offensive players #1 and #3. Notice that defensive players #5 and #4 are, as always, in direct alignment between the ball and the basket. 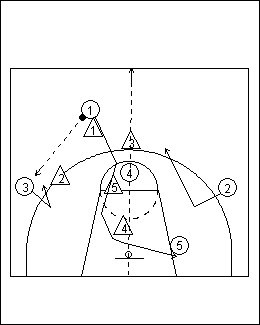 This will always keep 3 men between the basket and the ball as long as the ball remains on the perimeter. The skip pass completed, every defensive player moved with player movement and flight of the ball as dictated by the rules. This sequence shows offensive player #2 passing the ball to his teammate #1. All defensive players shift positions with the flight of the ball. 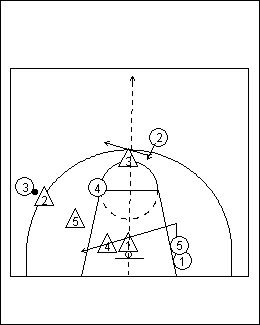 All defensive players have shifted positions according to the rules for this defense. Offensive player #1 reverses the ball to his teammate, #3 on the weak-side of the court. Once again, all defensive players move with the flight of the ball. 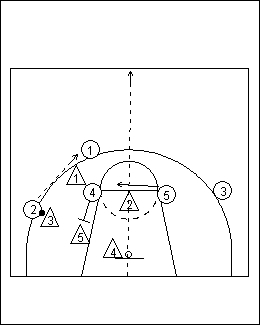 All defensive players have moved in unison with flight of the ball to the position shown in this final sequence. This defense is very effective against penetration. In fact John Wooden used a similar defense in all his 29 years of coaching. This defense is so simple, most coaches knew what he would do, but Coach Wooden's teams executed it with perfect precision. What Coach Wooden taught was not complex. It was just the way he taught it... with repetition, with focus, and without worry. Coach Wooden had the ability to stay in the moment. He once advised, "You can't have one foot in yesterday, or one foot in tomorrow. You have to keep both feet in today and that's how you get to tomorrow." A basketball service providing tips to coaching & teaching the game of basketball to the youth of the world.